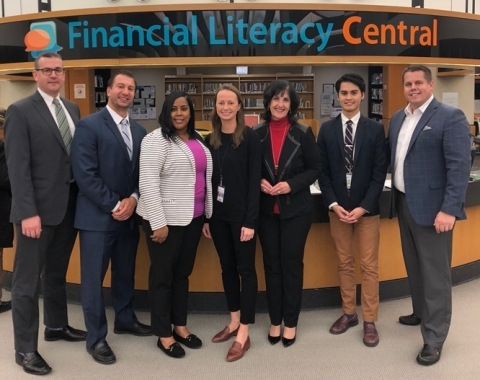 On October 26, the New York Public Library held Financial Planning Day at their Science, Industry, and Business Library, sponsored by Bank OZK. Over 500 New Yorkers took advantage of the myriad of resources available to educate themselves at no cost. The financial fair provided access to organizations like the U.S. Small Business Administration, Financial Planning Association of Metro NY, and the Social Security Administration. Many tables had brochures and other literature on hand for attendees to take home, and it was easy to have face-to-face conversations about financial concerns with representatives. Free classes were available, featuring topics like "Strategies for Smart Investing," "The Job Search: From Resumes to Offers," and "Caring For Your Aging Parents: Financial Implications & More." Some classes were so overflowing that a few attendees opted to sit on the floor. "Maintaining Focus on What Moves Markets," presented by Bank OZK's own Trust Investment Manager, Minnie Mills, was such a hit that many guests hoping to hear her insight couldn't fit in the room! The importance of financial literacy cannot be overstated. You work hard, and knowing how to spend and save wisely is an essential life skill. It seemed that New Yorkers got a lot out of this event, and we're proud to have been a part of it.